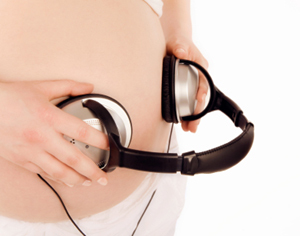 Fetal development: What does baby really hear in utero? It’s said that one of the best ways to comfort your newborn baby is to create a womb effect and mimic what they hear while nestled snug in your belly – noises like the blood whooshing through your body, the thump of your heart and the gurgles and rumbles from your digestive system. But your infant doesn’t have selective hearing in the womb – all the notes of your daily life are part of their development. Does their growth depend on the sounds you most often expose them to? Should you be sending more sound waves their way? The medical opinions on this are varied. Your baby’s ears begin to form around eight weeks and become structurally complete at about 24 weeks. Thanks to the magic of ultrasound and other high-tech tools, researchers have discovered that your baby is living in an auditory playground, responding to voices and other sounds they hear outside of the womb. Studies have found that a fetus can hear sounds, though muffled, at as early as 20 weeks and by the third trimester their hearing is intact. Sonograms show that your baby may turn their head in response to a noise. According to the American Academy of Pediatrics (AAP), the whooshing sound your baby hears in your womb is, to them, louder than a vacuum cleaner! However, most experts do agree that your baby can be startled by loud, unexpected noises – research has found that these jarring disruptions can change your baby’s heart rate, movements or even prompt them to empty their bladders, according to WebMD. Many pregnant women have reported a fetal jerk or kick at the sound of a backfiring car or slamming door. This being said, it’s also been found that a fetus’ heart rate often slows when they hear mom talking. So there’s a good chance baby not only hears you, but recognizes your voice and finds comfort in it. While it appears that the fetus can pick up specific speech patterns, it’s unlikely that it can pinpoint words – rather, it’s the tone that resonates with them, particularly low frequency sounds like dad’s voice. This also means that music is easily recognizable to baby. Does Playing Music Make Your Baby Smarter? Which brings us to the so-called Mozart-effect, a term coined by French researcher Dr. Alfred Tomatis in the early 1990s, that claims listening to classical music will enhance brain growth and neural connections. According to some doctors, this effect is highly exaggerated and there’s no solid evidence that in-utero interventions make your baby smarter or better adjusted. The belief in this effect has led to the creation of must-have gadgets for parents who want to stimulate the fetus in the hopes of upping their brain power before they’re even born. But is more better? And does it really matter if you’re listening to Mozart or Jimi Hendrix? Not necessarily. As yet, there is no firm scientific evidence that deliberate fetal acoustic stimulation does anything to influence a fetus’ creativity, smarts or development. In fact, some experts have concerns that pressing speakers to your growing belly could actually disrupt your baby’s sleep patterns or natural growth. WebMD reports that the stimuli your baby is naturally couched in, thanks to your everyday conversations and activities, is plenty to prepare them for the world outside the womb. In other words, Mother Nature does a pretty good job of presenting the necessary kind of stimulation at the appropriate time of baby’s development. Interestingly enough, the AAP reports that, compared to the sea of rhythmic sensations in the womb and the other sounds that filter through your belly, babies actually suffer from understimulation rather than overstimulation (which so many baby books advise against) as a newborn. It’s noisy in there – baby hears plenty of what’s going on inside and outside of you. So if you’re a fan of classic rock and play it all through your pregnancy, chances are baby will appreciate some Rolling Stones when they’re safe in your arms.